focused around IBM Notes/Domino, Java and Web Development. As I transition into doing more Java work in Eclipse I decided to use working sets there too. By default the Package Explorer in Eclipse does not display your projects grouped by their working sets although you can add new and existing projects into them. I also find it very useful that you can add a project to multiple working sets. If like myself you use working sets heavily this post from Paul Withers on Restoring Domino Designer…Including Working Sets will be very useful. 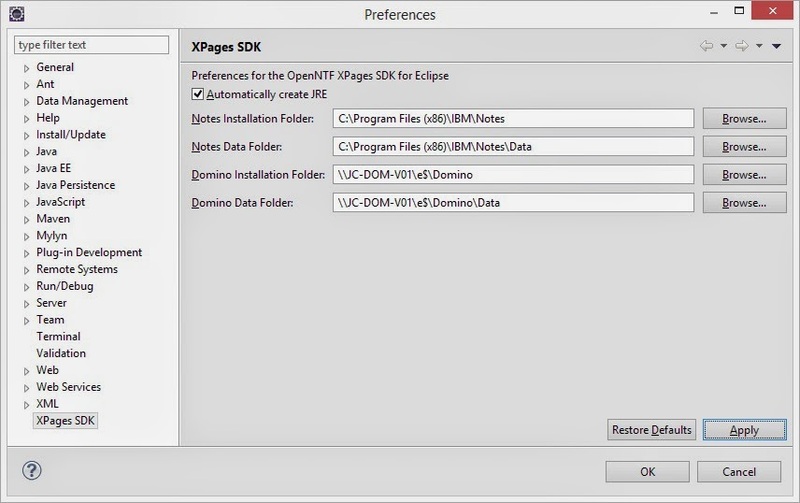 Anybody have any useful tips when using Eclipse for XPages OSGI Development? In my previous post I walked through creating a simple layout control as an OSGI plugin. The next step is to deploy the control to designer this is where the set up we did in part 2 comes in. 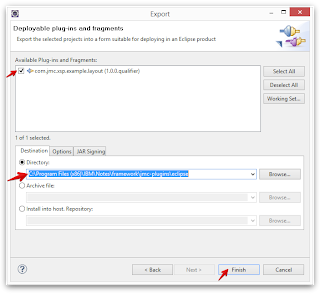 Select 'Deployable plug-ins and fragments' and click next. Ensure your plug-in is ticked then set the destination as 'Directory' and set that to be your newly created plugin directory, finally click finish. Your plugin should now be available inside Domino Designer. 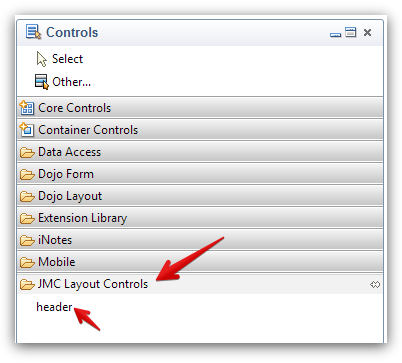 Inside Designer create a new XPage, now inside your controls palette you should see new category 'JMC Layout Controls'. Recently I have had a gentle nudge from a couple of people to continue my blog posts, as everyone can appreciate thinks occasionally fall be the wayside especially when children are about. 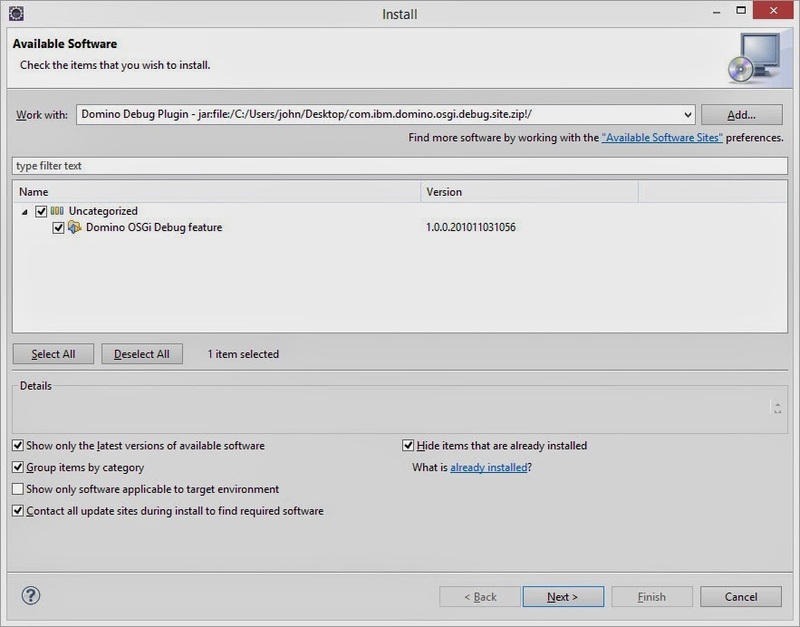 In my first post I discussed how to set up the eclipse environment for creating Domino OSGI Plugins and in the second how to configure Domino Designer ready install your plugins. In this post I'm going to walk through creating a very simple plugin, a standard page banner/header. Enter a project name, change the location if you wish and add to a working set if you like (I always do). You should now have a project open in Eclipse. To create a component you will need use some of the built-in Domino libraries therefore we will need to add them as dependencies to the project. The next step will be to create some classes, one for the component itself, one for the renderer and one for the library extension point. We will also need to create some of config files. In your newly create class you will need to set a renderer and a family, in this example I have created static variables then set the renderer type in the constructor and and overridden the getFamily method. Next we will need to create a renderer class. In the example I generate the markup in the encodeEnd method using a response writer. We now need to create the xsp-config and the faces-config files. Some people like to store these files within a META-INF folder in the src folder personally I prefer to have them in the same package structure as the rest of the plugin. 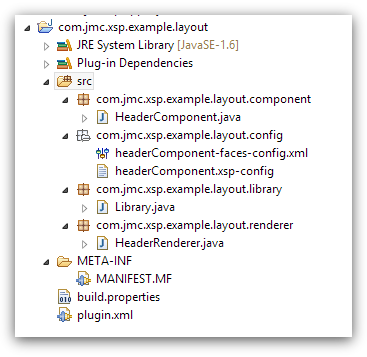 First create a new package in the src folder, I'm going to call it 'com.jmc.xsp.example.layout.config'. Then you need to create 2 new files inside this package; 'headerComponent.xsp-config' and 'headerComponent-faces-config.xml'. The xsp-config file is used by Domino Designer to add the control. The faces-config file will be used to map the control to its corresponding renderer. This done by matching the output from the control's getFamily and getRendererType methods to the component-family and renderer-type in the file. Finally we need to create a library class which is used when the library is loaded to find the names of the config files. The new class needs to have 'com.ibm.xsp.library.AbstractXspLibrary' as it's superclass. Now we have the library class we can contribute it as an extension point. You should now have a new extension listed, click service underneath the new extension then add 'com.ibm.xsp.Library' to the type field, in the class field ad the name of your library class in my case 'com.jmc.xsp.example.layout.library.Library'. Now save your changes. 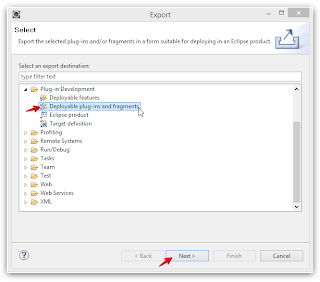 In my previous post I described how to initially setup eclipse in preparation for creating your own XPage plugins. This will then allow you to deploy your Plugins from eclipse and debug when necessary. 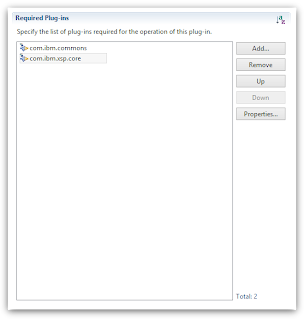 To use your own controls you will need to create a plugin and install this into Domino Designer and onto the Domino Server. 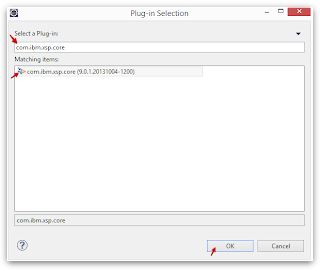 My preference is wrap the plugin up into an update site and install as described in this article: How to install the new XPages Extension Library with the Eclipse Update Site database. One of the issues with the above is that if you are constantly making changes to the control (eg. adding new properties) you need to continually export them to an update site, import the new update into Designer and restart, which after a few times becomes frustrating. So to get around the issue i make a couple of changes to my local Designer configuration as described below. Open your notes directory, navigate to the framework directory, create a new folder and name as you feel suitable (e.g. 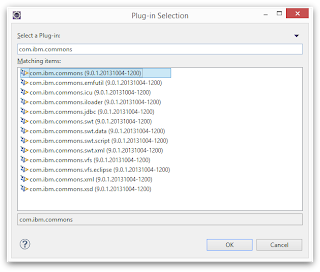 jmc-plugins). Inside the newly created folder create another folder called eclipse. ensuring the path is to your newly created directory. What the link file does is tells Designer to look in the new folder to load any additional plugins/features which will then allow you to export you plugin directly into this folder. Change the transient attribute on the config tag to false and replace all the instances of policy="MANAGED-ONLY" to policy="USER-EXCLUDE"
For these settings to take effect you will need to completely close Notes/Designer/Administrator and re-open. I have read that you need to use the following when restarting Designer using the command "designer.exe -RPARAMS -clean". I can't remember doing this myself. Recently I have been writing some of my own XPage components, initially i began writing them inside domino in the nsf that was using them. I eventually i began to put some of the controls inside other nsfs, but as always i had to make some fixes enhancements to the bugs Features that I happened to code into the components. I then had to go back to the other databases and apply these enhancements. So, I decided it was time to write my own plugin to deploy the components to the server so they would be available to all applications also giving me one place to update. In the next series of posts I'm going to describe how i set up my environment to create plugins using eclipse. 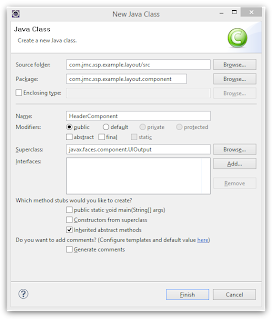 Firstly download Eclipse, I use Eclipse IDE for Java EE Developers however i think Eclipse for RCP and RAP Developers is also suitable. Now we have everything we can start Eclipse and configure accordingly. When you first start Eclipse you will be prompted to choose your workspace. 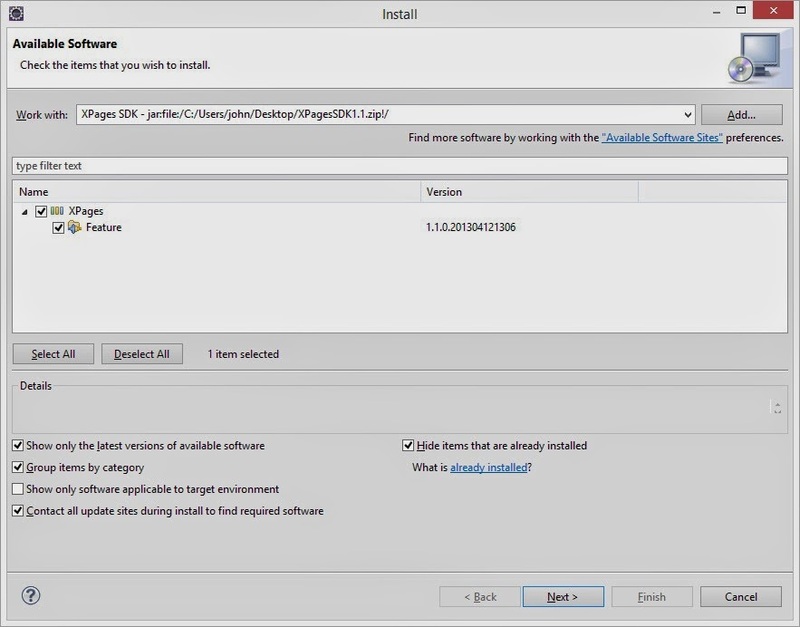 Change if you wish or just click OK.
Once inside eclipse go to Help -> Install New Software. When the Install window loads click Add to link to a new repository. Enter a name 'Domino Debug Plugin', click Archive and select the debug plugin update site you extracted earlier. Once the XPages SDK is installed restart Eclipse. Now we need to configure the XPages SDK. Goto Window -> Preferences and select XPages SDK at the bottom. Next go to Java -> Compiler and drop the compliance level to 1.6 (assuming it's not there already). Click Apply. Go to Plug-in Development -> OSGi Frameworks and select Domino OSGi Framework. Click Apply. 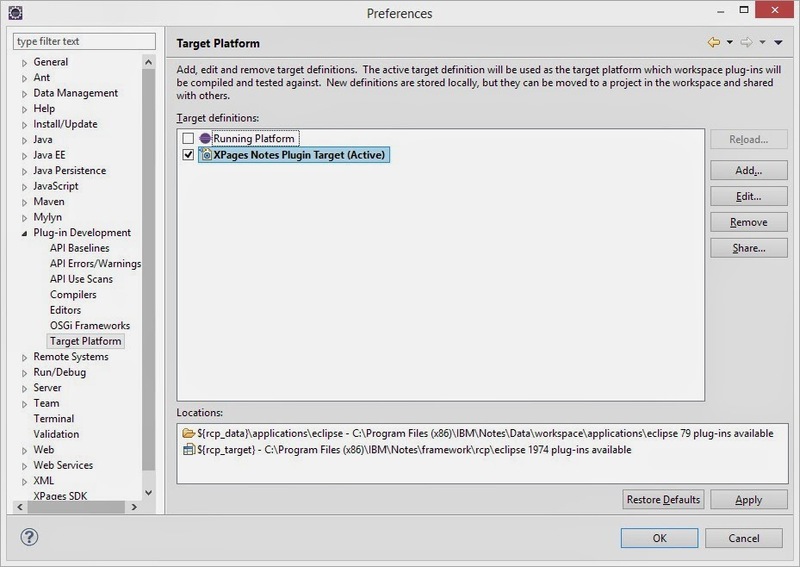 Finally we need to create a Target platform, fortunately this is easy with the XPages SDK installed. 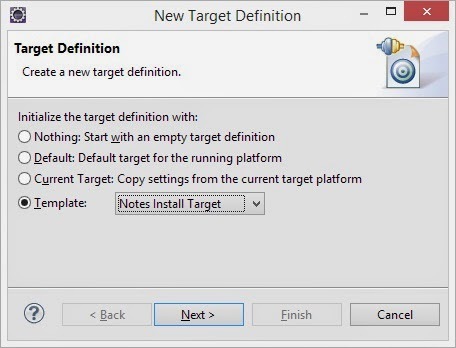 Now select the Target we just created and click Apply. There we go, we are now ready to begin creating a plugin! Recently i have been working on an application that requires a field with a limited number of characters (200 in this case). The function accepts 4 arguments; only the first 3 are required. allowExceedMax - this is a flag which allows the maximum number of characters to be exceeded but turns the colour of the count to red instead- this is optional. Replacing existing file with uploaded file from FileUpload Control. 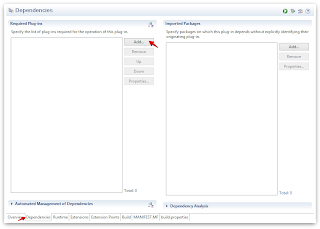 I have been creating an XPages application that contains 1 icon which is uploaded using the fileUpload Control and is displayed using an image control. Simple and straight forward. This was also not suitable as the first image that gets uploaded gets named 'icon.jpg' but the next image is named 'icon_1.jpg'. Finally, I decided the best approach would be to remove the first attachment before the second is uploaded and the way I decided to do this was using a validator. The validator is ran in the page lifecycle before the data model is updated (file is uploaded to the document). © John Cooper 2014. Simple theme. Powered by Blogger.